CHICAGO – Everyone’s favorite serial killer and family man, Dexter Morgan (Michael C. Hall) is back in tonight’s excellent fourth season premiere of the award-winning “Dexter”. Last season was good-not-great when compared to the first two installments but the opening arc of the fourth season hints at a creatively reinvigorated program that’s clicking on all levels. “Dexter” looks like one of the best shows of the fall. “I kill people - not exactly the perfect husband.” “Dexter” has always been about how a man with a monstrously dark and deadly habit conforms to normal society and deals with domesticity. 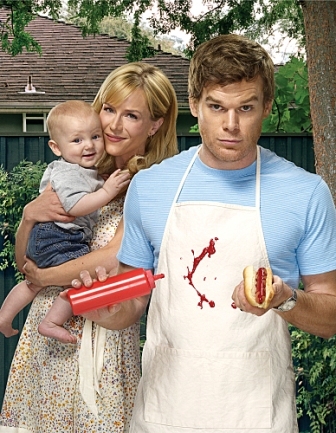 In the opening episode of season four, Dexter is constantly being pulled in opposite directions by his life as a new father. Blood pools have been replaced by car pools and swimming pools. And exhaustion. As any new father will tell you, sleep becomes an uncommon commodity and Dexter was a busy man before he became a daddy. It takes effort to be that good a serial killer. And an exhausted serial killer is not a good thing. Dexter has always been the one-man army that stops evil people from falling through the cracks due to poor police work. The premiere plays with the clever idea of making the crack-falling due to Dexter’s error. And it’s far from the worst exhaustion-based mistake that Mr. Morgan makes in episode one. Of course, no season of “Dexter” is complete without a guest star and this one has two. The great Keith Carradine returns as Detective Lundy and might rekindle what he had with Deborah Morgan (Jennifer Carpenter). Lundy is tracking The Trinity Killer (guest star #2 John Lithgow), a sick individual who may be the most successful serial killer of all time, having evaded capture or identification for thirty years. Lithgow has limited screen time in the first two episodes but will almost certainly make a riveting guest star this season. No, the first two episodes of “Dexter” belong to Michael C. Hall, one of the best actors on television who continues to add depth and believability to one of the best characters of the ’00s. Hall is very good, as usual, but he’s reinvigorated by some of the best writing in the history of the show. What’s so great about the premiere is the return to a hilarious blend of jarring tones that was a bit lost in season three. “Dexter” can be a very funny, very dark show. When Dexter sings “America the Beautiful” to his newborn son to get him to sleep while he looks at crime scene photos of the guy he’s going to kill that night, you’re supposed to laugh. This is jet black comedy that has always been part of the foundation of “Dexter” but seems to return to the forefront more at the start of season four. It’s not all laughs. The premiere of “Dexter” features two brutal murders and the show continues to push the boundaries of how comfortable you’re supposed to feel watching a mass murderer with a happy family. Are we supposed to root for Dexter to get his sh*t together or does he deserve to have it all fall apart? The premiere of this season of “Dexter” also features roughly a dozen plot threads starting to spin. Lundy returns, the Trinity Killer debuts, Dexter tries to be a father and a killer, and even Laguerta, Angel, and Quinn have subplots. This is dense, confident writing that stands with the best on television. Deb’s relationship with Anton and her search for her dad’s mysterious C.I. lover return from season three and even those recurring threads feel more confidently written. Everything from the writing to the acting to the pacing to the mystery feels more confident. Once again, I’m not saying that the third season of “Dexter” was “bad,” it just didn’t live up to the stellar first two and I was naturally concerned that the show probably never would again. After watching the first two episodes of season four, I’m very happy to report that the concern is gone, replaced by that same adoration for the show from the first two years. There’s a chance this could be the best season of “Dexter” to date. 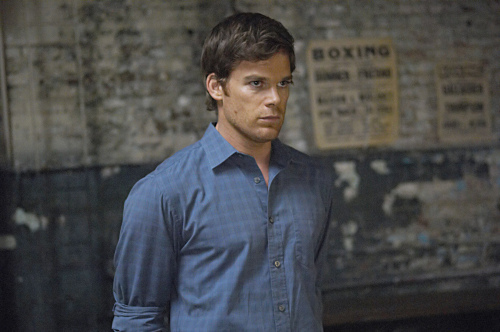 ‘Dexter,’ which airs on Showtime, stars Michael C. Hall, Julie Benz, Jennifer Carpenter, Lauren Velez, David Zayas, C.S. Lee, James Remar, Desmond Harrington, Keith Carradine, and John Lithgow. The season four premiere airs on Sunday, September 27th, 2009 at 9PM CST. Submitted by Anonymous (not verified) on September 27, 2009 - 6:13pm. Uhm, Dexter is actually on Showtime and not Fox. Submitted by TV Obsessed (not verified) on September 27, 2009 - 11:28pm. I liked the episode a lot, and overall I like everything about the show, except for one thing: long term creativity. Dexter continues to kill and wriggle out of different situation. It’s fun, it’s wrong to enjoy, but it’s the same. I’ll still watch, but I would like to see some changes. The first scene with the Trinity Killer is the most disturbing of the whole series.